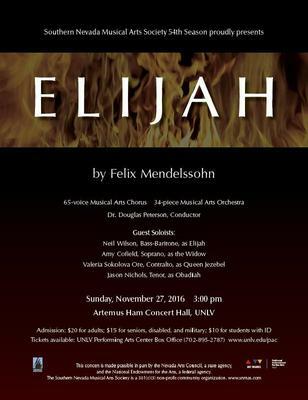 The Southern Nevada Musical Arts Society under the direction of Dr. Douglas Peterson celebrates its 54th Anniversary Season with a performance of Felix Mendelssohn's majestic oratorio, "Elijah" on Sunday afternoon, November 27th, at 3:00 p.m. in UNLV's Artemus W Ham Concert Hall. 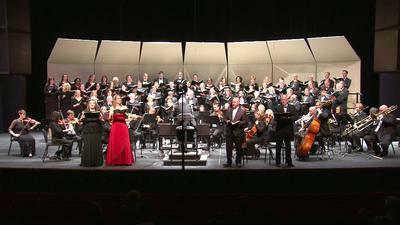 The oratorio “Elijah” received its premiere in 1846 and was immediately hailed an undisputed masterpiece. The popular oratorio has since taken its place as one of the greatest and most enduring works in the choral repertory. Sunday's concert features the Musical Arts Society's 65-voice Chorus, along with guest soloists and the SNMAS 34-piece orchestra. Bass-baritone, Neil Wilson, will perform the role of "Elijah" on Sunday in this his thirty-seventh appearance as soloist with the Society. His first solo performance with SNMAS, however, took place back in 1980 when he sang the bass solos in "A Sea Symphony" by British composer, Ralph Vaughan Williams. This is the third occasion that Dr. Wilson has sung the role of "Elijah" with SNMAS. Soloists and their roles include Amy Cofield, soprano (The Widow); Jason Nichols tenor (Obadiah); Valerie Ore contralto, (Queen) (Angel); Robert Peterson, (Ahab); and Carolyn Peterson (Youth). 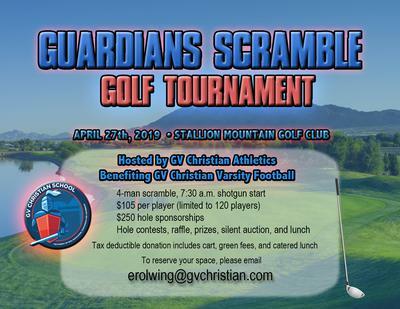 Admission is $20 for adults; $15 for seniors, disabled, and military; and $10 for students with ID. For more information call the UNLV Performing Arts Center Box Office at (702) 895-2787 or visit pac.unlv.edu.